In order to support immersive, interactive visualization techniques, NASA’s Advanced Supercomputing facility developed the hyperwall—an environment that visualizes and explores the very large, high-dimensional datasets produced by NASA supercomputers. NASA thought flash was a perfect fit for these latency-sensitive supercomputing workloads. However, when utilized in a centralized storage infrastructure, the flash media lost much of its latency advantage. 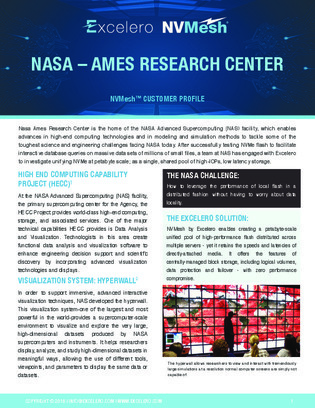 Read on to learn how NASA matched the hyperwall’s high-performance and scale with a solution that provides a petabyte-scale shared NVMe pool across multiple servers, available over a network at speeds and latencies of direct-attached media.